CLARKSVILLE, Tenn. — June 25, 2014 — Shannon Babb, starting from the outside of row one, powered around pole-sitter Ryan Unzicker on the opening lap and never looked back en route to grabbing his second victory of the 2014 DIRTcar Summer Nationals season on Wednesday night at Clarksville Speedway. Unzicker, who lead the series points heading into the night, managed to finish second but never had a chance to lead a lap, as Babb would pull away from the field by half of a straightaway. The race was slowed by two cautions, one at lap 21 and the other at lap 25, but Unzicker could not get back around Babb. Babb lead all 40 laps in dominating fashion, scoring a well-earned $5,000 payday and defeating Unzicker by two seconds. The victory on Wednesday night gave Babb his 85th career victory, returning his name to the top of the series all-time wins list, topping Billy Moyer in the season-long battle for the top spot. 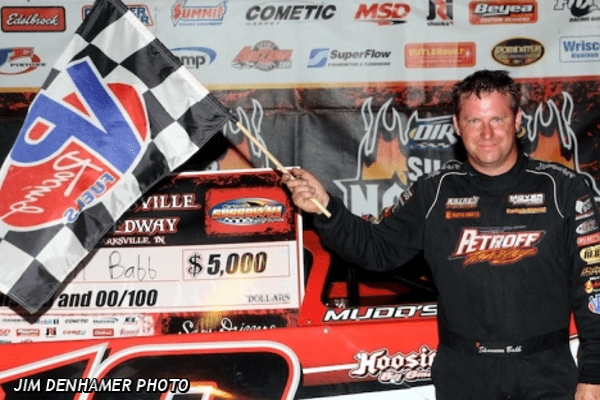 Babb and the tour heads to Paducah International Raceway Friday. Summer Nationals reach the Terre Haute Action Track on July 9 and then race the Herald-Review 100 on July 10 at Macon Speedway, where Babb is the defending race champion. Dennis Erb Jr., Tanner English, and Bobby Pierce rounded out the top five. Heat race winners included Erb Jr., Unzicker, and Babb. The DIRTcar Summer Nationals continues on Thursday night as they join the DIRTcar Summit Racing Equipment Modified Nationals at Clayhill Motorsports in Atwood, Tenn.
A-Main (40-laps): 1. 18-Shannon Babb ($5,000), 2. 24-Ryan Unzicker, 3. 28E-Dennis Erb Jr, 4. 96-Tanner English, 5. 32-Bobby Pierce, 6. 81-Brian Shirley, 7. 96T-Terry English, 8. C8-Timothy Culp, 9. 18S-Jack Sullivan, 10. 12B-Kevin Weaver, 11. B5-Brandon Sheppard, 12. 6M-Wendell Wallace, 13. 16-Justin Rattliff, 14. 15-Richard Frost, 15. 20-Alan Westling, 16. 54JR-Larry Barber Jr, 17. 81JR-Jason Riggs, 18. 27M-Rodney Melvin, 19. 94-Austin Rettig, 20. 61-Caleb Ashby, 21. 25L-Steve Lance Jr, 22. 74-John Minon.